How the standard "Ring" form of the 3,10 torus knot can be transformed to fit on the surface of a dimpled-sphere torus. How the 3,10 torus knot is defined by a "touch-pad magic square" whose diagonals, central row, and column add to 15). 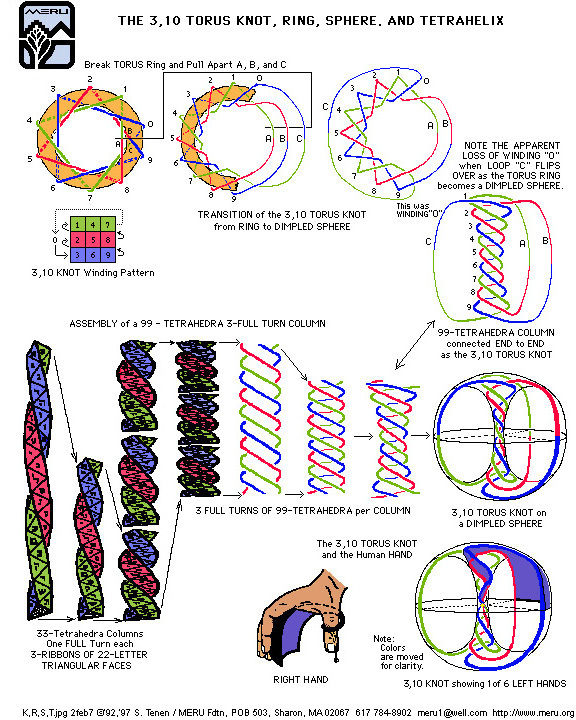 How the dimpled sphere form of the 3,10 torus knot defines 6 hand-shaped regions wound around a (6-thumb) tetrahelical central column. How the central column of the dimpled-sphere form of the 3,10 torus knot is composed of and defined by a column of 99-tetrahedra. How the 99-tetrahedra tetrahedral column consists of 3-ribbons of 3x22=66 triangular faces, with one triangular face for each of the 3 sets of 22-letters of a string of 3-Hebrew alphabets. See also the central Meru Foundation poster, Continuous Creation, for more information. For an a chart relating tetrahelical column length with 3,x torus knots, see the poster, Tetrahelix Accounting.